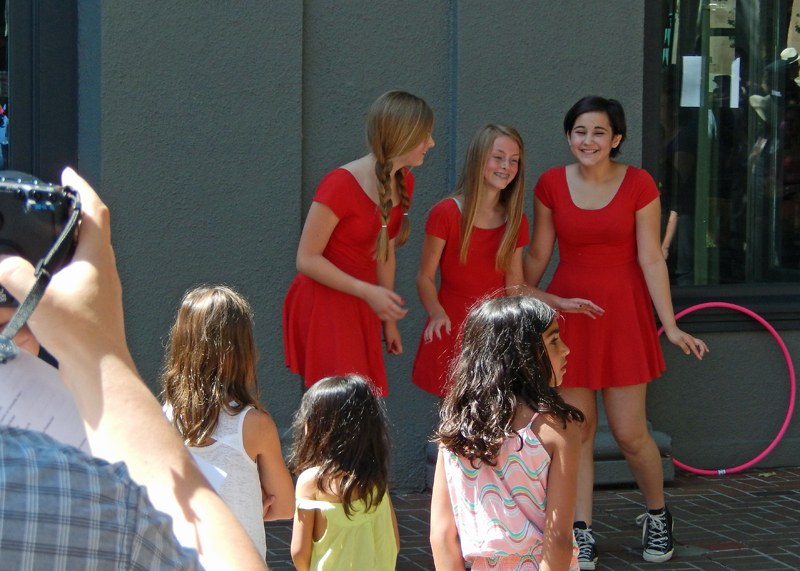 Their red dresses shimmer and shake when Emma, Ellie and Asia perform on the sidewalk in front of Restoration Hardware in Palo Alto. We applaud when the girls pause after their number. They grab new props, glance at their music teacher, Joanna Finnis, and launch themselves into the next song in their set. They’re 12 years old and keep the street side crowd engaged. 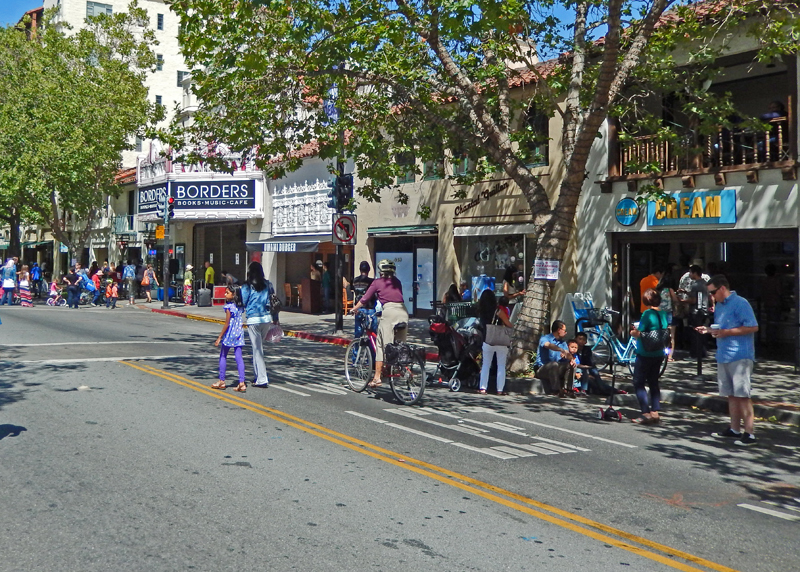 University Avenue is blocked at each end of the business district for World Music Day (always held on Father’s Day). University Plaza rocks with African drumming by Jaliya. The woman in orange and black listened for several minutes and then the beat took over: she rose from her bench and started clapping, she got the beat, and began to dance. One by one, several other women began to dance, and then a little boy of two or three stood up, flexed his arms and joined the dancers. At the end of the set, applause all around. Suska the Songstress beats out chords for her friend Mordecai’s rendition of When The Saints Go Marching In. 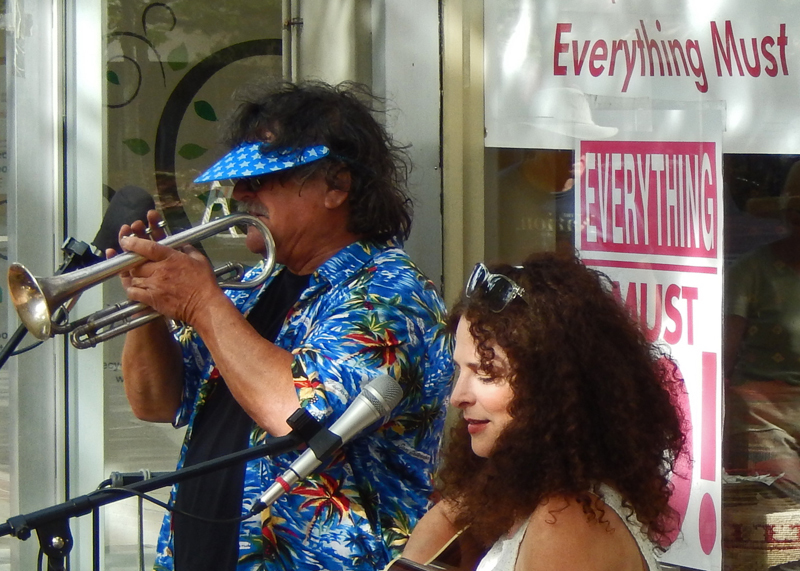 They are the founders of Hot Kugel a wild Klezmer band that is up next at this spot on University (across from the Tower and Bridge Bank). While Suska and Mordecai played jazz, across the street a West African beat was pounded out by Drumming Fun, a Palo Alto drumming school. Suska sang during the pauses of the drummers across the street—open air, street singing can be difficult for singers. University Ave — Closed for Music, Hooray! 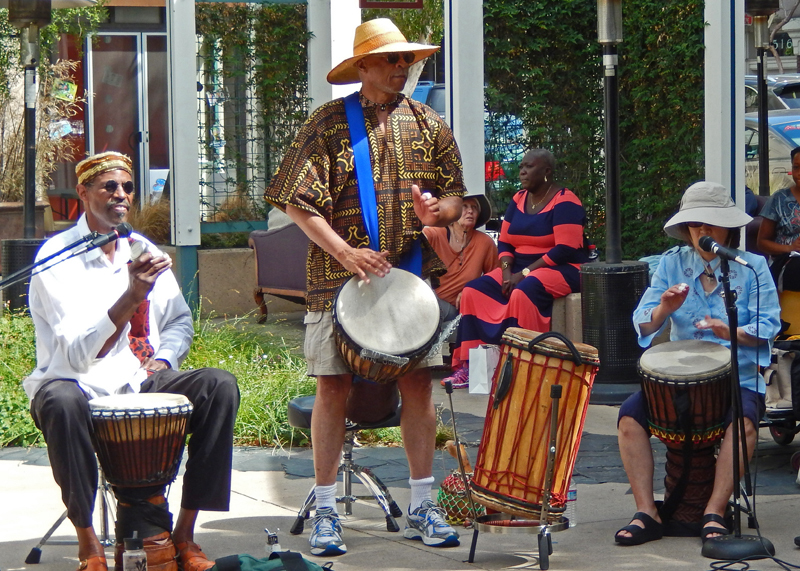 Actually, Father’s Day in Palo Alto is World Music Day — A day for the adventuresome to show off their music and entertainment talents. Written without adverbs for Writing 101, enjoy!